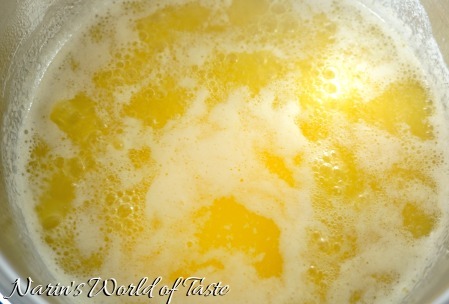 Ghee is traditional Indian clarified butter where the milk-solids have been removed through a boiling process. I like the slightly nutty flavor of ghee and I use it in many of my recipes. 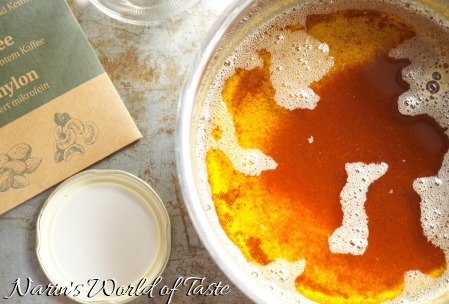 Making your own ghee is very easy and you will end up with a delicious fat that is very suitable for high-temperature cooking or frying. Give it a try! 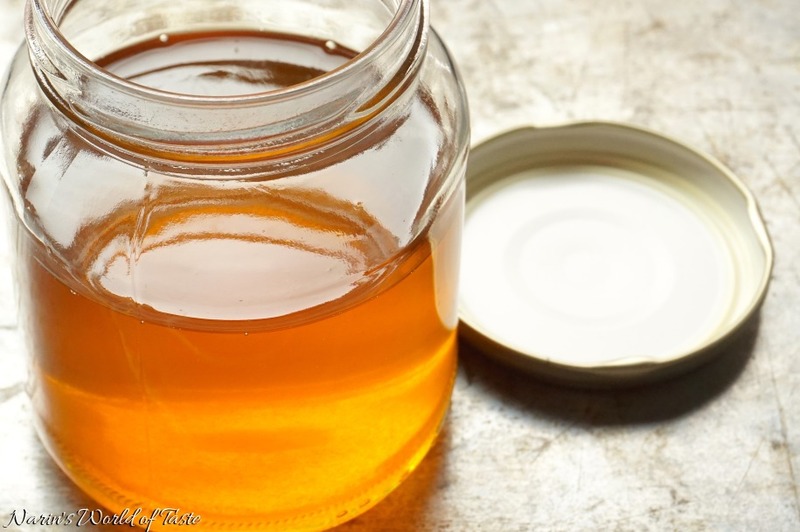 Ghee is also low in lactose and cassein-free, and many with lactose intolerance can enjoy it without problems. 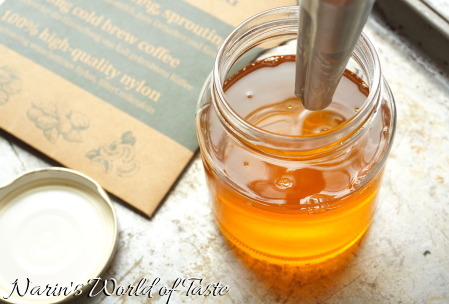 Prepare a glass jar to store the ghee when done. You don’t have to buy jars, you can re-use jars of ingredients that you cook with, for example, jars of organic chickpeas, lentils etc. Just make sure to clean them well. To make the ghee, melt the butter in a medium pot. 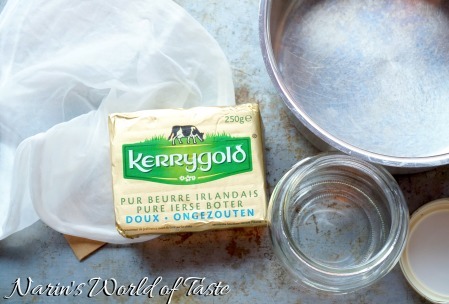 Once the butter is melted, the milk solids will separate from the clear fat. Continue to simmer the butter over medium to high heat until it starts boiling. This is when the water is cooking off. Reduce back to medium heat and simmer the butter further. After a few minutes foam will be building up on top. These are the milk solids. Continue to simmer until the milk solids start to brown and fall to the bottom (about 8 – 10 minutes after the butter starts boiling). They should have a deep golden brown color. Be careful to not let them burn, else your ghee will have a burnt taste to it. Remove the pot from the heat an set aside to cool a little. 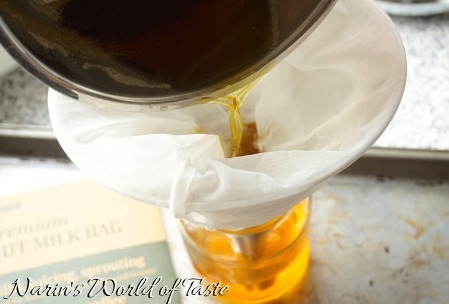 Strain the liquid though the nut milk bag (or cheese cloth) into a clean glass jar. You can store or refrigerate the ghee for about one month. Follow Narin's World of Taste's board Narin's World of Taste on Pinterest. Copyright © 2014-2018 Narin's World of Taste. All Rights Reserved.